› Super Bowl Tickets › Would Super Bowl Tickets For Chiefs-Saints Have Been Most Expensive Ever? While prices for Super Bowl LIII have rebounded from lows last week and are headed north, prices are not where close to where they'd be for the Chiefs-Saints matchup that we were a no-call and offsides from. Not only is it mind-bending to think that that that alternative universe was an offsides and missed call away from our reality, it also serves well to illustrate the bigger-picture state of the Super Bowl ticket market, and ticket market overall, in 2019. With that in mind, let’s rewind to Sunday morning before the beginning of the best championship game Sunday in NFL history. At that point, the cheapest ticket to Super Bowl LIII in Atlanta was going for $4,000, with an average price north of $8,000. In our alternative-universe match-up, instead of prices dropping 20% this week, Brees Versus Mahomes would have created tremendous buzz, both locally and nationally after their epic wins--sending prices up 20% amidst talk of torch-passing. In that world, buyers today would be talking about a $5,000 get-in target, not $2,000. The average price at the end of week one would have been $9,600, just short of the mythic $10,000 average price--a threshold achieved by only 2 events we’ve ever tracked. Instead, the average price at the end of week one was $7,400, only after a 15% price increase on Sunday. It's also possible that prices would have ended up even higher had corporate demand swelled. According to an article in Sports Illustrated, St. Louis based Anheuser-Busch was poised to purchase large quantities of tickets if the Chiefs had reached their first Super Bowl in 49 years. Other Kansas City companies like Hallmark and Sprint would have also driven up demand, especially given the fact that flights from Kansas City to Atlanta were available for under $200. While New Orleans has less of a big brand-name corporate footprint, Atlanta is the biggest post-college professional hub in the South, with lots of New Orleans natives who would have likely bid on game tickets. The best measure of how low corporate demand actually is this year may be the below chart, with shows the increase in quantity this year compared to 2017 and 2018. With less corporate buyers getting tickets directly from the primary ticket holder--in this case is NFL-Owned OnLocation--there’s more supply to push into the secondary market. For a Saints-Chiefs game, LIII secondary quantity would been closer to last year's lows, if not lower. For Super Bowl LII last year in Minnesota, the average number of daily tickets available in the two weeks between championship Sunday and the Big Game was 1,223, compared to 3,624 this year. 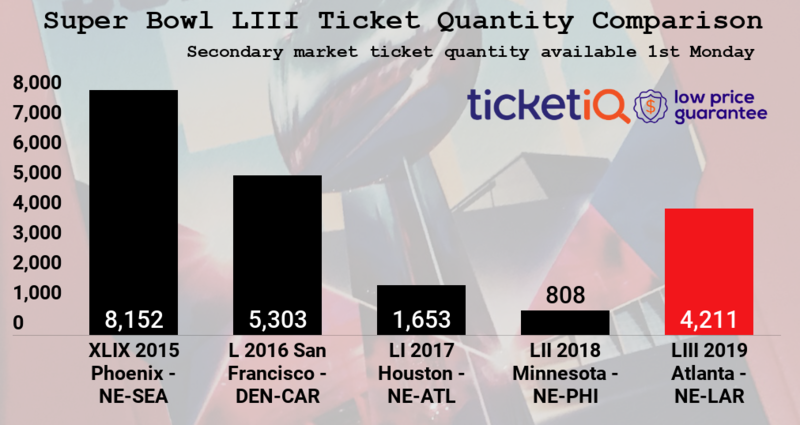 Yesterday, there were over 4,000 tickets available for the Super Bowl on the secondary market for the first time since 2016. So far prices in week two are holding firm, with the cheapest ticket at $3,000. After the runaway ticket market in 2015 when over 10,000 tickets (many that didn’t actually exist) were available through the secondary market, the use of that channel has decreased dramatically for the biggest event on the planet. As the above infographic shows, last year there was 90% less secondary supply than the same point in 2015. As always, the Super Bowl market is a reflection of the ticket category overall. Smaller secondary markets for the Big Game is a reflection a desire amongst teams and leagues to rely less on the secondary market as a way to price and distribute their tickets. That’s a 180-turn from Tom Brady's first Super Bowl when teams could not do that themselves. Over the last two years, the velocity of change in ticket market, as picked up steam, as teams as diverse as the Knicks, Warriors, Redskins and Hurricanes have all reimagined their ticketing ecosystems as team-driven and technology-enabled. In that universe, the owner of the tickets is the biggest seller, and focused on direct-to-fan distribution through their primary ticketing platform. The Super Bowl is no different, Last year, OnLocation rolled out their own brand new ticketing platform with Tickemaster where fans could buy actual seats directly. In that world, the secondary market is supposed to be relegated to a...secondary role. For what may be the least anticipated Super Bowl in recent history, however, the secondary market again leading the way, one price drop at a time.